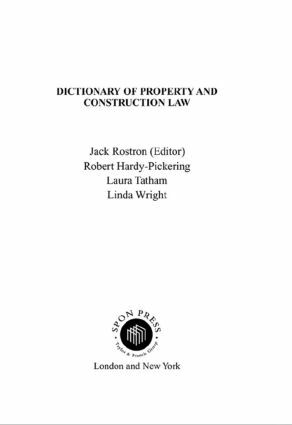 This is a new dictionary which provides a clear and concise explanation of terms used in land, property and construction law and management. The four key areas of coverage are: planning/construction law, land law, equity/trusts and finance and administration. It will be a useful reference for property and building professionals and a personal purchase for students of property and construction law on building, construction management, estate management and law courses. Jack Rostron is an experienced author and editor whose 1997 Spon title Sick Building Syndrome has been well received and widely reviewed. His co-authors contribute the necessary specialist knowledge from their respective fields of teaching and legal practice.